You can create and manage OpenShift applications in Eclipse with the latest version of the OpenShift Plugin for JBoss Tools. They are either pre-bundled with the latest JBoss Developer Studio (9.0.0.GA) or you can install them into an existing Eclipse Mars. 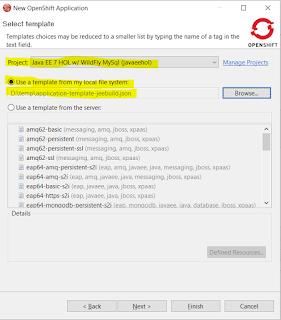 This post walks you through deploying the Java EE 7 Hands-On-Lab in OpenShift with the JBoss Developer Studio. The OpenShift 3 tooling is included as a TechPreview. It will allow you to connect to OpenShift 3 servers using OAuth or Basic authentication, manage your OpenShit 3 Projects, deploy new applications in the Cloud, using pre-defined (or your own) templates, or even Docker images. You will be able to import existing applications in your workspace, monitor them via remote log streaming directly into your local console, or enable Port-Forwarding and access their data as if it was local. And while we're at the command line, let's create a new OpenShift project for this example. 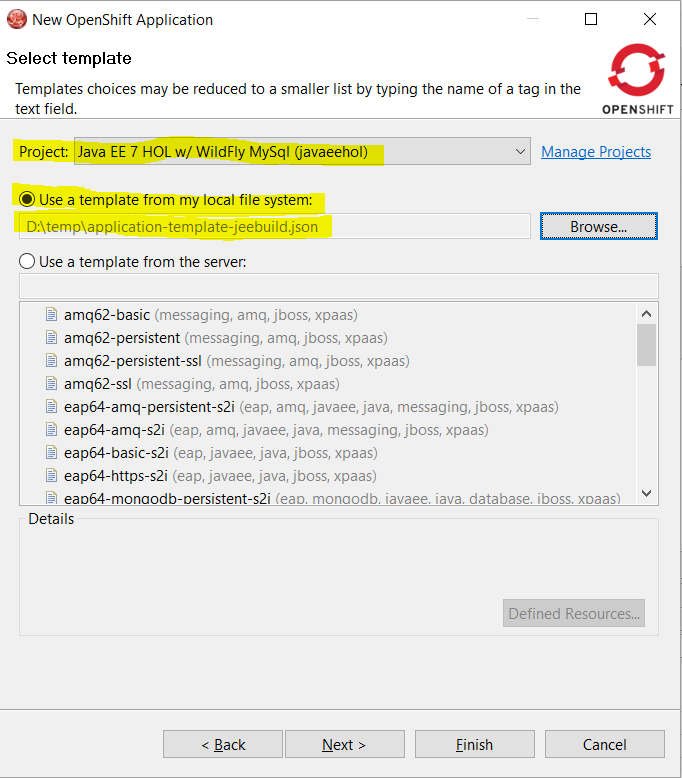 oc new-project javaeehol --display-name="Java EE 7 HOL w/ WildFly MySql"
Install and fire up your JBoss Developer Studio. 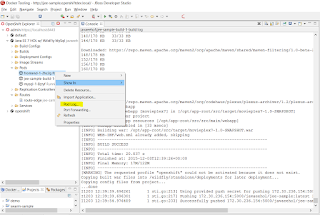 If you want to get started with the JBoss Tools in an existing Eclipse distribution use this package from the Eclipse marketplace. 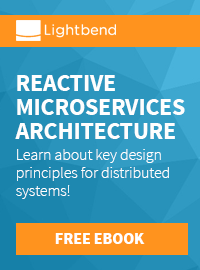 Create a new OpenShift Project. Select OpenShift 3 as server type, change the server to https://localhost:8443 and enter the token you gathered from the cli into the token field. When you click next, the credentials are verified and you need to accept a warning about an unsigned certificate when using the all-in-one vm. Select the project from the first drop down list in the next dialogue. The dialogue also lists all available templates on your server.A complete list can befound on github. We want to use our own template in this case. The Java EE 7 Hands-On-Lab has been converted into a Kubernetes template by Ben Pares. So, we're going to use this. Download it from Ben's Github repository and save it locally. Open it with a text editor and change the "apiVersion" value from v1beta3 to "v1". And in line 47 is a host entry which says: "www.example.com", change that to "jee-sample.openshiftdev.local". And while you are in a text-editor make sure to add an entry to your hosts file which maps the loopback interface to the changed domain name. Select "Use a template from my local file system" and browse to the place you saved it. After clicking next you see another dialogue which allows you to change the template parameter values for the various passwords. Leave everything as it is and click "next" again. The following dialogue will let you add additional labels. Just click "Finish" now. The final dialogue gives you an overview about the executed actions and generated passwords. Make sure to write them down in case you need them later. OpenShift actually build a new docker image with the javaee-hol in it and deploys the result as a new pod. Time to see everything in action. Point your browser to http://jee-sample.openshiftdev.local:1080/movieplex7-1.0-SNAPSHOT/ and see the Movieplex application in action. OpenShift Explorer View - The embedded Web Console. The OpenShift Explorer View lets you connect to OpenShift 3 instances, create new applications, manage domains or projects, execute action such as Port-Forwarding and Tail Files (Log Streaming). Specific actions are available, depending on the version of the OpenShift instance you’re connected to. For OpenShift 2 connections, you can configure cartridges, for OpenShift 3, you can access Pods, Routes, Services and deploy Docker images. Just expand the tree and right click on the resource you're interested in. 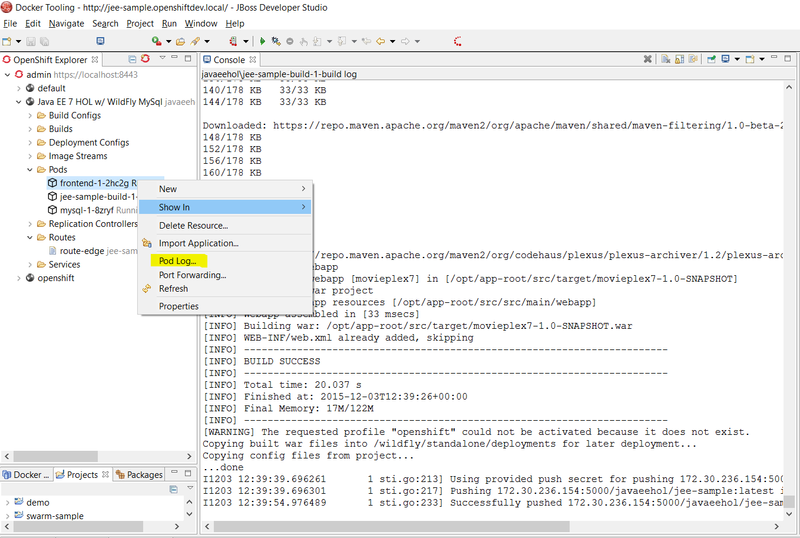 For example, like in the following screenshot to access the frontend logs. You can find even more details about the Docker Tooling and other features in the detailed feature description. Learn more about OpenShift Origin and how to get started with the All-In-One-VM. Take the Java EE 7 Hands-On-Lab and follow the individual steps to get a refresher in Java EE 7. Follow @OpenShift on Twitter and stay up to date with latest news. Feel free to reach out to me in the comments or via Twitter @myfear.